While the deep flesh and soft skins of fresh figs are fabulous eaten just as they are, this intense chutney captures the fruit’s rich sweetness perfectly. Combine all the ingredients in a large saucepan. Bring to the boil, reduce the heat, and simmer, covered, for 30 minutes. Uncover the pan and continue simmering for 30 minutes, stirring often, until thick and richly flavoured. If the chutney becomes too dry, add a splash of water. Taste and correct the seasoning, adding brown sugar, vinegar, or chilli flakes as needed. Spoon into sterilised jars and seal. The chutney will keep for several months, unopened, in a cool, dark place. Once opened, refrigerate and use within 4 weeks. 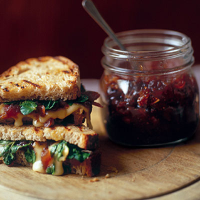 Use the chutney to make some Brie toasties. Butter 8 slices of sourdough bread with 40g unsalted butter. Lay half the slices buttered side down, and top with 150g sliced Brie, some watercress and 4 tbsp fig chutney. Grind some black pepper over; top with the remaining bread, buttered side up. Heat a griddle pan till smoking, then cook the sandwiches for 2 minutes each side, until well-marked and oozing cheese. Cut into pieces and serve straight away. Serves 4.